You have a web site – maybe even a Facebook business page. Your business is online now, but are you satisfied with the results? Do potential customers find your business before they find your competitors? Are you effectively using social media to virally acquire new customers and generate a vibrant community of fans? Are you happy with the amount of visitors to your web site? Do they turn into paying customers? Are you looking for a trusted partner to help you navigate online challenges and stay ahead of competitors? We specialize in Web Site Promotion. We have spent thousands of hours promoting our own sites and client sites and in the process have created promotion resources and tools that are standard reference for thousands of webmasters. 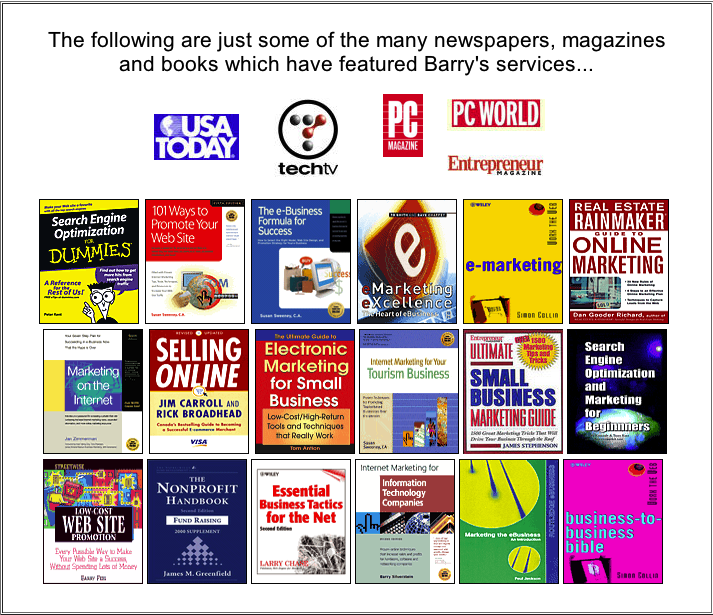 Our services have been featured in PC Magazine, USA Today, Entrepreneur Magazine and countless textbooks and marketing handbooks. We are a boutique consulting firm offering highly personalized service from a best-in-class expert in SEO, SEM and Social Media Optimization. Our clients work directly with our CEO and serial entrepreneur, Barry Brooks. Please scroll down to learn who we work with, how we work and the services we provide. Proper placement in Google can make or break an online business. With 15+ years of SEO and SEM experience in some of the most competitive on-line niches, let us perform a SEO audit on your web site to help you achieve top search engine rankings and optimal visibility. Very few businesses are correctly using Social Media. Let us leverage the power of Facebook, Instagram, Twitter and more to virally acquire new customers and generate a vibrant online community of fans. We can train your staff or offer a turn-key outsourced social media solution . Facebook ads are currently the new frontier of web marketing, but they are commonly misused. We can reduce ad costs by up to 50% and design campaigns that will leapfrog competitors. Equally important, we specialize in Adwords PPC marketing and have been managing campaigns since Adwords first began in 2000. Being prominently listed in local search is one of the easiest ways to attract customers using their mobile devices for search. Is your business properly optimized and represented in local search engines like Google Places, Google+, Bing Local, Yelp? We can help. Copyright 2014, Website Promotion, Inc.